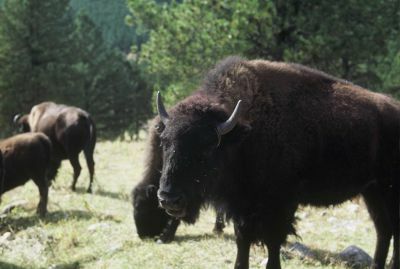 The bison is the largest land mammal in North America. Males (bulls) weigh up to 2,000 pounds, females (cows) weigh up to 1,000 pounds. They are strictly vegetarian, a grazer of grasslands and sedges in the meadows, the foothills, and even the high-elevation, forested plateaus of Yellowstone. Bison males, called bulls, can weigh upwards of 1,800 pounds. Females (cows) average about 1,000 pounds. Both stand approximately six feet tall at the shoulder, and can move with surprising speed to defend their young or when approached too closely by people. Yellowstone is the only place in the lower 48 states where a population of wild bison has persisted since prehistoric times, although fewer than 50 native bison remained here in 1902. Today, the bison population fluctuates from 2300 to 4500 animals.